You can use your popup for login or registration of the users. 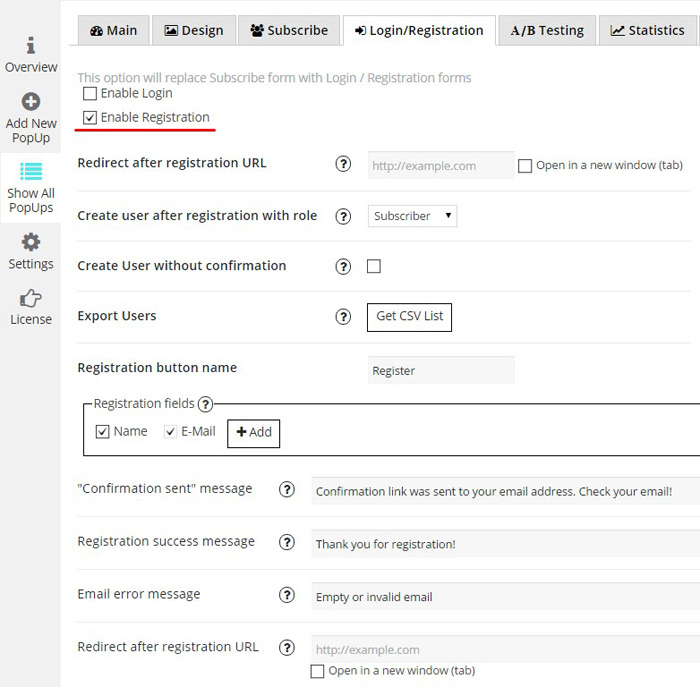 This option will replace Subscribe form with Login / Registration forms. You can find the settings at the Login/Registration tab and just enable what you need. Note, that you can enable only one of the form. Login button name – the ability to change the name of Login button. Add Forgot Password link – will add Forgot password link to restore user password right befor Login button. Create user after registration with role – use this only if you are really need it. Remember! After you change this option – your new users will have more privileges than usual subscribers, so be careful with this option! Create User without confirmation – usually, after user registration, we send email with confirmation link – to confirm email addres, and only after user will click on link from this email – we will create new user. This option allow you to create user – right after registration, without email confirmation process. Set the “Confirmation email was sent” message – this will be message, that user will see after subscribe – that email with confirmation link sent. Set the email for New Member Notification – enter the email addresses that should receive notifications (separate by comma). Leave it blank – and you will not get any notifications. Check all these features in our PopUp plugin! Enjoy the registration popup example!